Welcome to our Pet of the Week page! Once a week we will update this page with the newest featured kitty and we will keep all the previous Pets of the Week that have yet to be adopted on this page as well. All of the cats on this page have been spayed or neutered. They have also been blood tested for both Feline AIDS and Feline Leukemia, vaccinated for distemper, rabies, and leukemia and microchipped for identification. 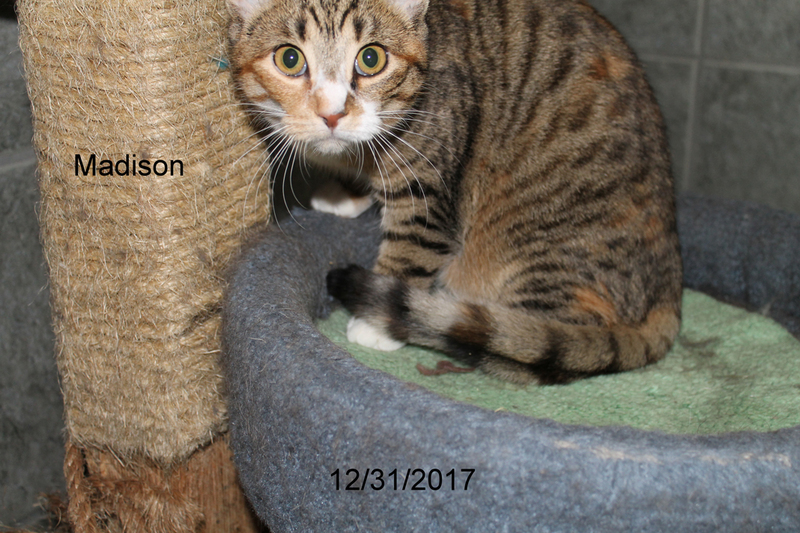 The adoption fee is $75.00 and this includes all previous medical care, an ID tag and collar, cardboard cat carrier, and a booklet on proper cat care. All adoptions are by appointment only so that we may guide you through the process and assist in the selection of the right cat(s) for your family. Please call Marsha at 937-376-5550 to schedule an appointment. Why She is Special: Karen was a stray in downtown Dayton. She is a very loving lady that dotes on attention from humans. She gets along well with other cats and kittens, plays a lot, and enjoys being petted. If Karen does find her forever home before you get the chance to make her your own, there are plenty of others in need of homes that would be just as great a family member as she would be. Why She is Special: Gretel (and her brother Hansel) were left homeless when their owner was put into a nursing home. She is a very typical kitten who loves to play, eat, sleep, and be petted. She and her brother are both very loving kittens who would enhance your life with their presence. Why She is Special: Carla was the last of her family after a coyote got the rest of them in rural Xenia. She was quite traumatized when she came to The Tenth LIfe. She adapted to her new surroundings very quickly and has become a very loving, playful, cute as a button kitten. Although she is not quite ready for adoption, Carla has a growing list of admirers hoping for her great forever home to come to her as soon as she is spayed. Why He is Special: Jay (and his sister Chatty) were strays in Beavercreek trying to survive out in very cold weather. A concerned lady brought them to The Tenth Life where they have prospered. Jay is very loving and typical for a kitten. He loves to play, eat, sleep, and enjoy attention from any human he meets. Why She is Special: Madison was part of a stray litter in Waynesville. She was taken in by a Tenth Life volunteer and was raised with other kittens about the same age who were also being fostered before coming to The Tenth Life. She is very loving and a very typical kitten. She loves to play, eat, and sleep. She loves all the human contact she can get and would make a great "lap cat". Why She is Special: Miranda was a stray in Springfield. She was taken in by a caring lady who could not keep her but ended up bringing her to The Tenth Life. She is a bit shy at first, but warms up nicely when given the attention she needs. She could be a great lap cat for her permanent home owner. Why He is Special: Hansel (and his sister Gretel) were stray kittens in Miamisburg. He was feral when he came to The Tenth Life. With a lot of "TLC", he has become a very typical kitten. He loves to play, eat, and sleep. He now enjoys human contact and could make a great "lap cat" once he is comfortable in his forever home. Why He is Special: Marvin and two companions were surrendered because of health issues in the family. He is a delightful cat that gets along very well with other cats. He truly enjoys human contact and would be a great "lap cat" once he is comfortable in his forever home. Why She is Special: Pooder was an owned cat in Dayton. Her mommy could no longer take care of her properly and she was brought to The Tenth Life to find a new forever home. She gets along well with other cats and enjoys human companions. She truly gets very happy when she is being petted. Pooder would make a great addition to your family if given the opportunity. Why She is Special: Orange Blossom is a very sweet older kitty. She was surrendered by a family that could no longer care for her. She gets along well with other cats and thoroughly enjoys a lot of petting from all the humans she meets. Why He is Special: Jeep is one of four siblings (two girls and two boys) found in Kettering., He would be a great addition to your family. Jeep is a very typical kitten in that he loves to play, eat, and sleep. He gets along well with other cats and thoroughly enjoys human contact from each person he encounters. Why She is Special: Claire, and her sister Rachel, were strays in Miamisburg. She is a little shy at first but warms up nicely when she realizes you like her. Otherwise she is a very typical kitten in that she loves to play, eat, and sleep.She gets along well with other cats and is getting better about being comfortable with humans. Why She is Special: Margot was found huddled under a storage shed in Xenia during winter with her kitten. She gets along well with other cats and is very comfortable and loving with humans. Why She is Special: Robin was a stray in Beavercreek with her sister Pat. She gets along well with other cats and is very comfortable and loving with humans. Why He is Special: Ringo, his mommy, two brothers and one sister were brought to The Tenth Life at the age of 2 days. HIs one sister and one brother have already been adopted to their forever home. He and his brother George are still looking for their homes. He is very much a kitten who loves to play, eat, and sleep. He gets along well with other cats and is very comfortable and loving with humans. Why She is Special: Ansley was a stray in Kettering. She is a very loving cat that gets along well with other cats and all humans. She would add life to your household if you gave her a chance. Why He is Special: Claude (and his brother Clarence and sister Clarinda) came from a litter of strays in Englewood. He is very loving and is a very typical kitten in that he loves to play, eat, and sleep. Once he arrived at The Tenth Life, it did not take long for Claude to start winning hearts with his friendliness and warmth. He gets along well with other cats and is truly loving to all humans he meets. Why He is Special: Mickey was a stray in Fairborn. A very compassionate person at a business on the edge of town contacted The Tenth Life to see if we could give Mickey a chance at a home of his own. He is very charming to people and gets along well with other cats. Why She is Special: Carina was an abandoned cat in Centerville. At first, she was frightened and a little afraid of human contact. She has overcome that shyness quite nicely and adores all the attention she can get. She seems to like other cats and enjoys playing with them. She would make a great addition to your family. Why He is Special: Van was an owned cat in Dayton. When his owner could no longer keep him, she contacted The Tenth LIfe for a re-homing opportunity. Van has become a very loving kitty who enjoys all human conatct. He seems to like other cats and enjoys playing with them. He could make a great addition to your family. Why She is Special: Cagney and her sister Lacey were abandoned kittens in Dayton and were an instant hit at our facility. They are very typical kittens who enjoy running and playing. Lacey was adopted recently leaving Cagney without another kitten with which to play. She likes other cats and enjoys playing with them, but would love a family to give her the attention she knows that she deserves. Why He is Special: John was an owned cat in Dayton. When his owner could no longer keep him, she contacted The Tenth Life for a re-homing opportunity. At first, he was not comfortable in his new environment. With some TLC, John has become a very loving kitty who enjoys human contact. He likes other cats and enjoys playing with them. He would make a great addition to your family. Why He is Special: Benjamin was part of an abandoned litter that was hand raised by a volunteer of The Tenth Life. Benjamin is a very loving kitty who enjoys human contact. He likes other cats and enjoys playing with them. He would make a great addition to your family. Why She is Special: Deanna was part of an abandoned litter that was brought to The Tenth Life. Deanna, and her twin sister Donna, are very loving kitties who enjoy human contact. They enjoy other cats and thrive on playing with them. Deanna is very tiny and will probably grow up to be a small adult. She would make a great addition to your family. Why He is Special: Eddie was a stray in Centerville. When he came to The Tenth Life he was frightened by the complete change in his normal environment. Since his arrival, he has become very loving. His preference is a quiet and private surrounding. He does get along with his roommates but prefers solitude. He has the potential to be a great "lap cat". Why She is Special: Gidget was a stray in Jamestown. When she arrived, she was frightened by the complete change in her normal environment. Since her arrival, she has become very loving. Her preference is a quiet and private surrounding. She does get along with her roommates but prefers solitude. She has the potential to be a great "lap cat". 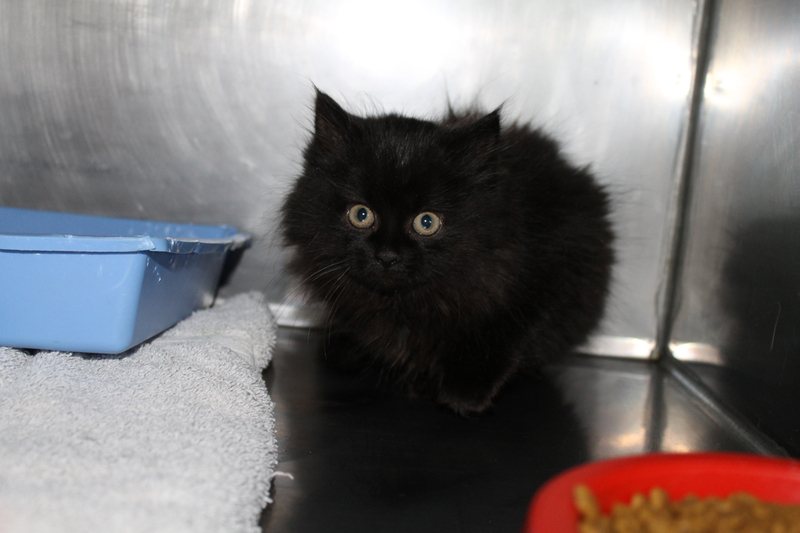 Why He is Special: Zorro and his two sisters were very young abandoned kittens in Bellbrook. He was very small and did not have much chance of getting bigger as his sisters would push him away from any food. We sent Zorro to the home of a volunteer who specializes in raising under-aged kittens. He thrived in that environment and has returned to The Tenth Life for adoption into his forever home. He is very loving and dotes on human attention. Zorro gets along very will with other cats/kittens. Why He is Special: Betty was mother of a stray litter in Bellbrook. She was taken in by a volunteer of The Tenth Life. Betty was a bit shy when she arrived at our shelter but has become quite loving over the time she has been here. She now enjoys human contact. She likes other cats and enjoys playing with them.